Turning away these people is fundamentally unAmerican, unjust, and utterly wrong. Trump states that we will not allow anyone into our country that is not here legally. That if they want to come and be a part of our "great" nation they need to do it the right way. He claims these people are an invasion. The caravan of Central American migrants who are coming to seek asylum is, in fact, doing it the right way according to our laws regarding asylum seeking. So why are they being tear gassed? What are the current laws? According to the AIC (American Immigration Council) the definition of a refugee is as follows, "a person who is unable or unwilling to return to his or her home country, and cannot obtain protection in that country, due to past persecution or a well-founded fear of being persecuted in the future on account of race, religion, nationality, membership in a particular social group, or political opinion." Congress decided to incorporate this definition in the Refugee Act of 1980 and is now a part of US immigration law. According to the 1967 Protocol, and U.S. immigration law, the United States has legal obligations to provide protection to those who qualify as refugees. Our laws indicate there are two paths to obtain refugee status. Either abroad as a resettled refugee or in the United States as what the caravan is attempting to do, as asylum seekers. As the AIC puts it this can be done by "the affirmative process and the defensive process. Asylum seekers who arrive at a U.S. port of entry or enter the United States without inspection generally must apply through the asylum process. Both processes require the asylum seeker to be physically present in the United States." The difference between the two processes is the current status of removal proceedings. If you are not yet in removal proceeding you can apply via affirmative but "If the USCIS asylum officer does not grant the asylum application and the applicant does not have a lawful immigration status, he or she is referred to the immigration court for removal proceedings," where the asylum seeker can request for asylum through the defensive process. So basically once you are being threatened for removal you can go through the defensive process and if you apply through the affirmative process you are likely to also have to apply through the defensive process. After filing for the process (which can and likely will take years) an asylum seeker must prove that he or she meets the definition of a refugee with or without counsel. Often providing substantial evidence throughout the processes demonstrating either past persecution or that they have a "well-founded fear" of future persecution in their home country, the individual's own testimony is critical to this determination. 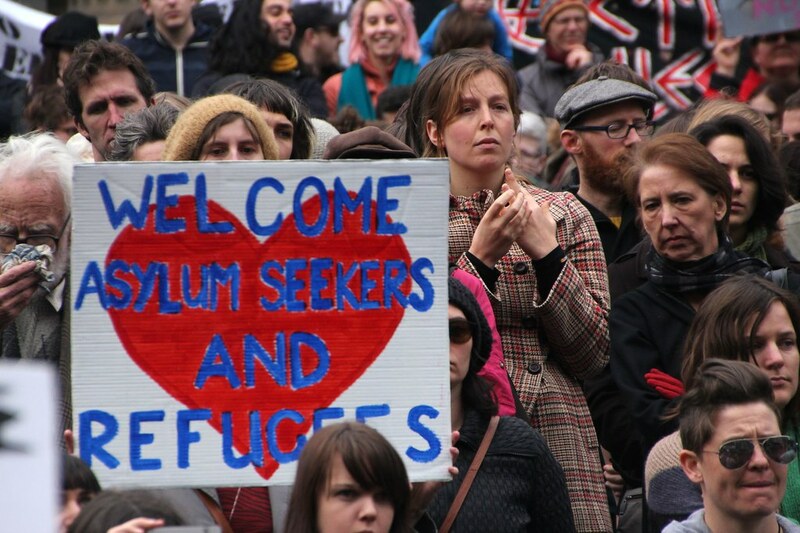 Certain factors can legally bar individuals from asylum. With limited exceptions, individuals who fail to apply for asylum within the one-year time limit of entering the United States and those who are found to pose a danger to the United States will be barred from receiving asylum. The caravan person so far has yet to meet either reason for banning. So, therefore, these people who are in fact seeking asylum are attempting to follow our laws and areas such being violently and wrongfully treated by our own government for trying to follow a tricky confusing set of laws. "Poor, miserable people, families, mothers, children, fleeing from terror and repression, for which we are responsible, and in reaction, they're sending thousands of troops to the border. The troops being sent to the border outnumber the children who are fleeing," says Noam Chomsky, a linguist, philosopher, cognitive scientist, historian, political scientist, and social critic. The reason is that they are fleeing from persecution, poverty, and violence in their home countries of Honduras, Guatemala, and El Salvador. The as of 2015 in Honduras was 60 per 100,000 which decreased only by a little and then El Salvador nearby increased to 100 per 100,000 people. Making El Salvador the most deadly country outside of a war zone this is due to gang-related violence which in percentage the homicide rate was 103 per hundred thousand only falling by thirty percent since 2015. Their countries, which form a region known as the Northern Triangle, or "Troika of tyranny" were rocked by civil wars in the 1980s, leaving legacies of violence, poverty, fragile institutions, military coups, etc. In a 2015 investigation founded by La Presena, a local newspaper reported that Salvadorans and Hondurans pay an estimated $390 million, $200 million, and $61 million in extortion fees to organized crime groups. Which many of the asylum seekers have claimed as a dominant reason for leaving along with the fear of their children grow up with the pressure to join or be killed. As many fear, and rightfully so as the report claims many attacks are on people who do not pay contribute to the violence. Meaning that the choice is to continue feed into the violence and anarchy, stay and likely be murdered, see your children fall into these organizations, or take a chance and flee. Once you flee, you cannot go back. In short, there is a legal obligation to hear asylum claims from migrants who have arrived in the United States if they say they fear violence in their home countries. If an asylum seeker enters the US illegally, they are still entitled to a hearing of their claims. These people have rights even though they are not from our country. They are human. Scared and fearful for their lives and the lives of their families they have come to us, seeking hope and safety, greeting by their hope tear gassing them and saying hello with military force. This is wrong. It is not American justice and rightfulness. Let's fix it now.